Written by: Rachel Fellman on July 24, 2013. 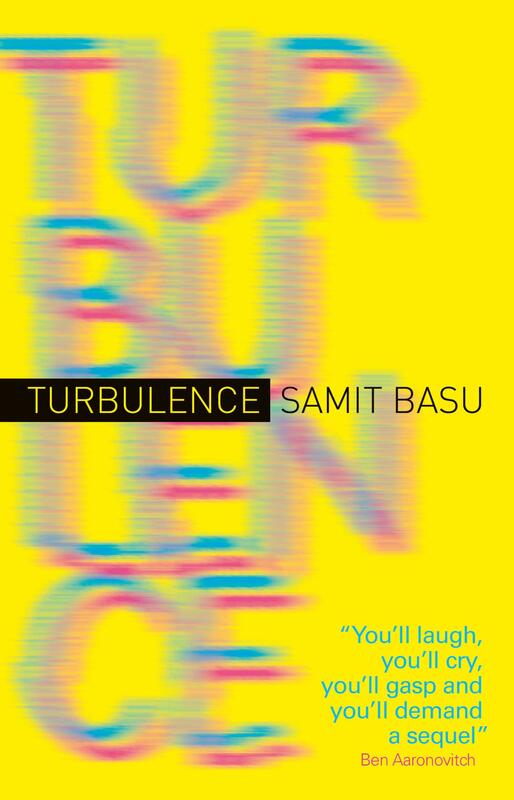 If TV Tropes could write a novel, it would read like Samit Basu’s Turbulence — witty, deeply engaged with its geeky references, and best enjoyed in sessions of half an hour or less. Its view is unrelentingly lofty, and its tense is an eternal present in which everything seems to be happening at once. 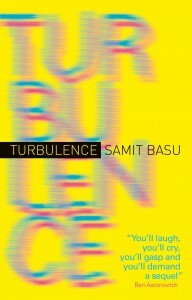 Turbulence is an Indian superhero novel, a new myth for a rising superpower. (I’m certain that every reviewer will go for that pun, but it’s only because Basu has the restraint not to use it directly.) Everyone on a certain flight from London to Mumbai steps off it with a new ability, linked with their deepest desire. A couple’s wish for a god-baby is granted. An actress suddenly finds that everyone she meets adores her. A computer expert gets a permanent Internet connection in his head, and a little girl gets to be Sailor Moon (with the serial numbers filed off, as the mysterious grantor of the superpowers has a keen eye for trademark trouble). Some of the empowered are more enthusiastic than others. And some of them start to dream big – of world conquest, or heroic leadership, or captaining the Indian cricket team. The central struggle for the novel’s de facto hero, the WiFi-equipped Aman Sen, is how to keep all of this from turning into a Superman movie. More than anything, he wants to avoid a pointless clash of titans which leaves numberless unnamed lives in its wake. His dream is for the new superheroes to work for social justice, to see ordinary humans as something other than collateral. But his attempts, at best, are desperately flawed, and the execution of this bothers me. It’s not that I don’t essentially agree with Basu. Powers corrupt, and humans are only human. If Aman hadn’t made serious mistakes, I would’ve called foul. But Basu writes from the same cynical distance as the stories he’s reacting against – stories about supermen fighting in the sky for the right to decide the course of more ordinary lives. However his heroes define “justice,” they’re all trying to give people what they need without asking what that is. As a result, their imagination for change is impoverished, and a novel that sets out to subvert received ideas ends up fulfilling them. It also keeps trying to anticipate the reader’s questions. Basu’s characters are always noting and justifying the text’s failings or cliches – the villain’s lack of personality, the generic quality of the powers, Aman’s limited understanding of economics, the lack of combat-powered women. Some of the results of this are interesting, and honestly, some of these problems aren’t problems – particularly in relation to gender. Basu is a stylish and observant character writer whose women are as complex as his men. That’s rare, and it’s all I personally need. No, the only trouble is that the novel defines itself too much by what it is not. It rarely gets around to a positive idea of what it is. Turbulence does have some excellent comedy, especially in the broad but sparkling opening chapters, which are proof that cynicism isn’t always a bad thing. Basu’s flair for character extends to a real understanding of what makes each character funny, both intentionally and unintentionally on their part. He’s willing to let his characters be both ridiculous and sympathetic, and at his best, that makes for a cast who are a genuine pleasure to live with. I can’t deny that Turbulence is an enjoyable read. It’s a solid geek tragicomedy. Some of the references have already begun to date, but there are always more lurking behind them. The problem is that the entire novel is composed of great hooks that aren’t always attached to anything, and that its view of superheroism is almost indistinguishable from what it’s trying to subvert. Maybe in the sequel, Aman will land somewhere; for now, he’s still gliding along at 10,000 feet, trying to decide how to rearrange the world below. Disclaimer: A review copy was provided by the publisher, Titan Books. A positive review was not specified, and all views expressed are my own.